Taking this a step further, we have overlaid the UPC and the EAN graphics (symbologies) so you can see that the graphic is identical. The country code doesn’t appear beneath the barcode in a UPC since the GS1 didn’t grasp the importance of US and Canada indicating country codes. They felt that since the majority of products sold in both countries originate from importers, distributors or manufacturers in the US or Canada, they could forego the leading zero in the human readable numbers. We still believe that if you are currently doing business in the United States and Canada exclusively, it is safer to order UPC barcodes for your products. Many retailers, especially smaller retailers may be using older accounting and inventory systems that only allow them to enter in 12 digit UPC numbers and not a 13 digit string. If this changes in the future, you can convert your 12 digit UPC to a 13 digit EAN by adding in the country code 0. There is nothing on the horizon indicating that the US and Canada will ever switch over to EAN 13 barcodes. When I conceived the U.P.C. for the grocers in the U.S. only 12 digits were required including the check character. I designed a symbol in which the left half of the symbol was composed of “odd” parity characters and the right side was composed of “even” parity characters. Each printed character has two bars and two spaces and is made up of 7 modules. Odd parity simply means the printed representation of the numeric digit has an odd number of dark modules. Conversely even parity printed digits have an even number of dark modules. Looking to buy a barcode? Want to learn how barcodes work and how they help you get your product to market? Watch our informative video about EAN and UPC barcodes. Periodically we do a search to see what our competitors are doing and we chuckle at the assortment of nonsense in the marketplace. There are people touting that they are the official source or official site. There is one fellow who tells people to be wary of low prices. There is one that says, “Avoid Shady Imitators.” Our marketing strategy is to lead with knowledge…not to diminish our competitors with their weaknesses. We fall within the first class. We legally and professionally do what we do….and we do it really well. In addition, we have an A Rating with the Better Business Bureau. This speaks to our being an ethically based business. Nationwide Barcode is in the business of selling barcodes. We do have another business which focuses on new business development, marketing and promotion. We help people and companies get better at what they do. For us, our business is working with people in business. It’s not Horse Chiropractic, selling fishing bobbers or other unreleated diversion. Our focus is helping people market themselves or their products…and a barcode is a very important part of that. We are listed on Mr. George Laurer’s Website as being a legitimate reseller, we are the preferred vendor of choice a ton of clients but most notably, Pandora. Pandora is the world’s largest internet radio company that dovetails with Amazon. We have thousands and thousands of repeat customers throughout the world equally divided between small to mid size manufacturing companies, independent musicians and Amazon resellers. We obtained all of our prefixes prior to that August 2002 date, we’re part of a grandfathered program with the GS1 which insures that can do what we do and we don’t pay renewal fees. Since we do not pay renewal fees, neither do you. Our business is based on providing barcodes at a very affordable price. We can afford to be the lowest in price because of simple supply and demand. We have a very large supply and there is a high demand. Since we have a high demand, we can afford to be the least expensive in the industry. We want to make a lot of money but our strategy is to make money based on the volume of barcodes sold…not from one customer. In addition, we base our business on great customer service and knowledge. This knowledge is not just about barcodes but about retail and wholesale process management. We know how barcodes work, we understand graphic design and label manufacturing and wholesale and retail process flows. We are members of Printing Industry of America, Visual Media Alliance and several Amazon groups that allow us to stay informed of upcoming changes in the industry. Our goal is to be the ‘last man standing’ in this industry. The majority of our competition only has one barcode prefix, they are attempting to turn a quick buck from this asset. This means, when they sell out, they’ll disappear. Your barcodes will continue to be good, but if you need support, you lose your certificate of authenticity and need help, they will be gone. When you need support a year or two or five years from now, we’ll be here. With our reserve of almost two million barcodes, we will be around for a long, long time…plus with our secondary business of ‘new business development’, we’re not that hard to find. Our business is helping you. It’s what we do. We have a toll free number and each order comes to you with Nationwide Barcode’s President and Founder, Phil Peretz’ direct phone number. If you want to contact Phil by e-mail, you can e-mail him at phil@www.nationwidebarcode.com – He answers every email personally. Nationwide Barcode appreciates your business. Why our ‘All Sales Final Policy’ is the best guarantee for you. If you are looking for guaranteed unique barcode numbers, our fair but firm policy makes the most sense for you. 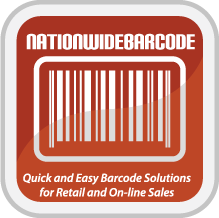 Because of our integrity and unique business proposition, you are safer buying barcode numbers from Nationwide Barcode than from any other reseller. With over a million barcodes in our pool, we have never had to refund anyone. We are careful. We know that doing it right thing the first time is important. 2. Our customers are smart. You know what you are doing and if you don’t, you are smart enough to know to call and ask questions so we can help coach you in this labyrinth of barcodes. 3. We do not take barcodes back…ever. We do not take a barcode that we issued to one person and put it back into our database. We do not have a 1-day, 5-day, 7-day or 30-day buyback policy. We cannot take this chance. Since our customers are smart (see #2) this will not be an issue. This is a potential issue with the majority of our competitors. Since they cannot compete against us with experience, knowledge of the industry nor price, they create Return Policies to make you feel good about doing business with them. A guarantee is good (If you have a problem with a number, we’ll give you your money back), a return policy creates a pool of ‘used’ barcodes. We don’t do that. We value all of our customers and want to make sure everything goes perfect. That’s our commitment. What’s the Difference between a UPC and EAN? There are two components to a barcode graphic. The barcode graphic and the number beneath the bars. 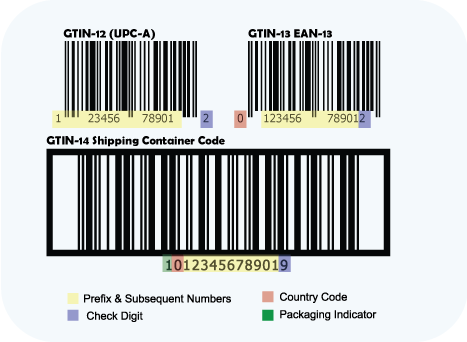 The GS1, the original source for barcodes, has created the confusion between UPC (Universal Product Codes) and EAN (European Article Numbers also called International Article Numbers). The UPC-A barcode was the original format for product barcodes. As demand in Europe, Asia and Australia started growing, country codes were added. (We have a list of country codes on this site). US and Canada have a a country code of zero which is not printed under the barcode nor is it entered in US and Canadian Inventory and Point of Sale Databases. Other countries are able to scan and read UPC barcodes. The majority of retailers throughout the world will accept UPC or EAN Barcodes from Nationwide Barcode. The exceptions are some of the major retailers like JP Penney’s, Krogers and Walmart. These retailers require that you provide certificates directly from GS1. We have heard that Walgreen’s and Macy’s also asks for the barcode certificate but may optionally input the UPC number of each product. It is your responsibility to ask your retailers if they will accept UPC or an EAN numbers from a company that subdivides barcodes. Click on this link for information about the difference between the GS1 and Nationwide Barcode to make an educated decision about buying barcodes. UPC and EAN Barcodes are used for both conveying pricing information to the Point of Sale Systems in stores (electronic cash registers) and maintaining inventory for the retailer. You need as many barcodes as you have products or variations of products. If you are selling shoes, you would need one unique barcode for each style, color and size. If you are selling soft drinks, you would need one for the 12 oz. can, the 12 oz. bottle, the six or twelve-packs, and the liters of each flavor. Every variation of a product needs a unique barcode. If you only have one product and you are manufacturing one or 1,000,000 – each piece will have the same barcode number. The primary type of barcode used for retail packaging is a UPC-A barcode or simply, a UPC. 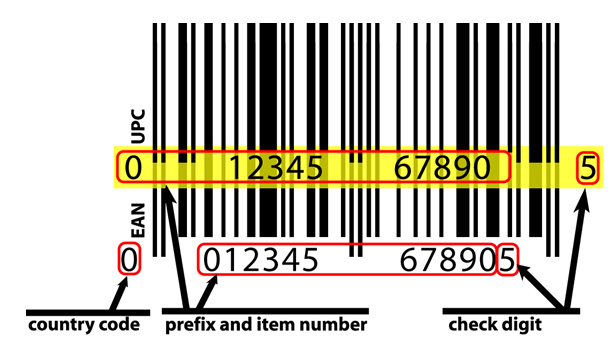 A UPC bar code also known as a Universal Product Code is a unique 12-digit code that allows wholesalers and retailers to track the sales and inventory of your product in their store (web and brick and mortar stores). 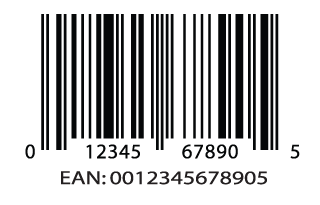 The bars on a barcode are merely a graphical representation of the numbers below the barcode. 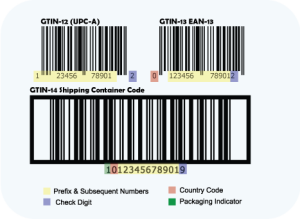 A Shipping Container Barcode is used on the outside of our master cartons and recommended or required by many mid-to large retailers who are automating their incoming inventory processes The UPC Shipping Container Symbol, also called a GTIN-14 is very similar to the Universal Product Code but uses a different symbology. The major difference between this barcode and a UPC barcode is the lines at the top and bottom of the barcode. These are called Bearer Bars. The Barcode is comprised of 4 groups. We charge $20.00 per shipping container code – Be sure you select the Shipping Container Code from the drop-down menu. If you have any questions about your barcode graphic purchase contact us BEFORE buying. If you need more than 5 barcodes, please contact us at info@www.nationwidebarcode.com or 775-376-8075. The last digit of the UPC code is called a check digit. In the case of our example, 7 This digit lets the scanner (and the computer attached to it) know if the number was scanned properly or not. The number at the far right is the check digit. In this case, it’s a 7. If you want to compute the check digit for a UPC-A Barcode in Excel, do the following: Put the 11-digit number you want to compute the check digit for in cell A1. There is no hidden data built into a barcode, there is no pricing information, there is no product information. The bars represent only the 12-digit number. The way that it works is: The manufacture affixes the barcode to the product. The retailer inputs information about the product into their back-end computer that controls and communicated to all of the store’s Point of Sales systems (cash register). The customer brings up their purchase to the front counter, the item is scanned and the POS system communicates to the back-end system pulling the information about the product. The info is printed on the sales receipt, the price is charged and then, the items are deducted from the store’s inventory. The manufacturer identification number is the first six digits of the UPC number — 753182 in the image above. The next five digits — 95342 — are the item number. The GS1 also supplies 7, 8 and 9 digit manufacturer numbers as well. A person employed by the manufacturer, called the UPC coordinator, is responsible for assigning item numbers to products, making sure the same code is not used on more than one product, retiring codes as products are removed from the product line, etc. Typically, every item that a manufacturer sells, in addition to every variation of the item requires a different item code.